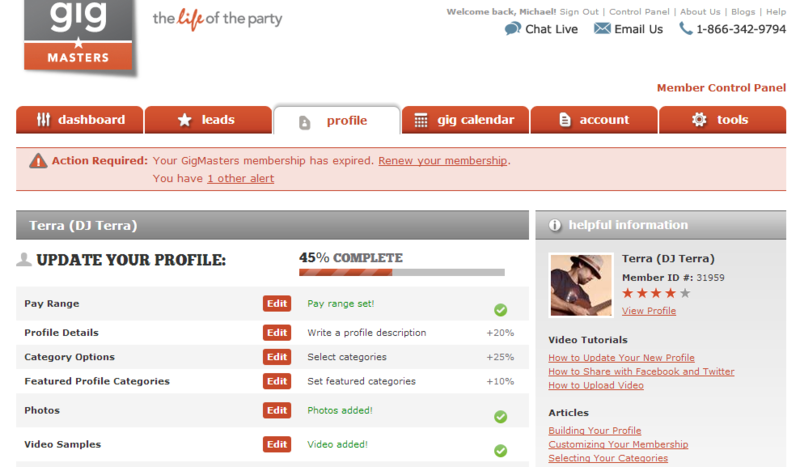 We’ve just redesigned the profile tab of your Control Panel to make it even easier for you to get ready for your GigMasters clients. As you can see in the screenshot below, the emphasis is now on pointing out exactly what you need to do to complete your profile. That's because a complete profile attracts clients and helps you get more leads and more bookings. It's one of the keys to success on GigMasters. This particular member profile is 45% complete. They've still got some work to do - like write a profile description and select categories and featured categories. To edit any specific section of your profile from this page, just click appropriate"Edit" button and we'll take you right where you need to go. Of course you can always edit and update your profile, even if we see it as being 100% complete. In fact we encourage you to keep your profile up to date with your latest media and info. Updating your profile from time to time is a great idea. A little spring cleaning never hurt anyone! Everything here functions just the same as before, only now we’re pointing out exactly what you need to do to complete your profile. Any questions? As always, feel free to contact us any time.